Cook spaghetti in boiling water. Add salt and cook until spaghetti reaches desired tenderness. Drain and mix well with olive oil. Melt butter in a pan. Add mushrooms and stir-fry until aromatized. Add some sugar and salt. 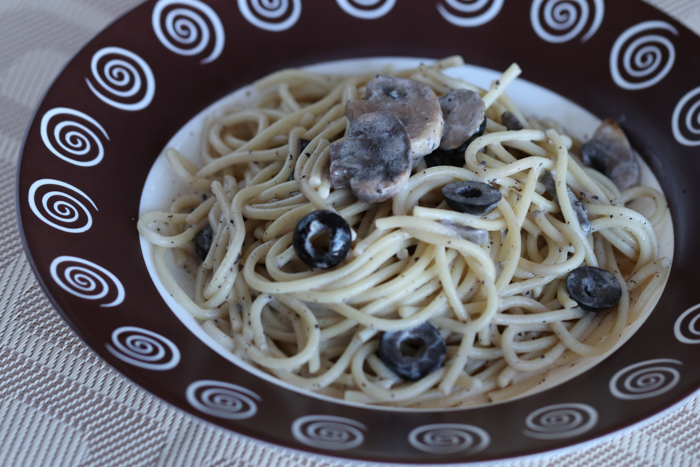 Add spaghetti when mushrooms are half cooked. Add seasonings and stir-fry for 1 minute. Add black olives and all seasonings and stir-fry for a while. Serve. How long should spaghetti be cooked depends on the tenderness you desire. Do not rinse spaghetti in cold water.